*** Time for this post? Reading… 3 minutes. Completing documents… unknown and worth every minute. Dancing… as long as you want! Quick! Do your near and dear know where your mother was born? Or your father’s full name exactly as it is on his birth certificate? They should…because the funeral home will ask for these details (unless you’ve prearranged your funeral and already given them the information). Do your kids know if you or your spouse ever received Family Allowances or the Child Tax Credit? They should know that too…because the government will want the answer when your family applies for the Canada Pension Plan Death Benefit. Not me, until I began getting all my paperwork ducks in a row. 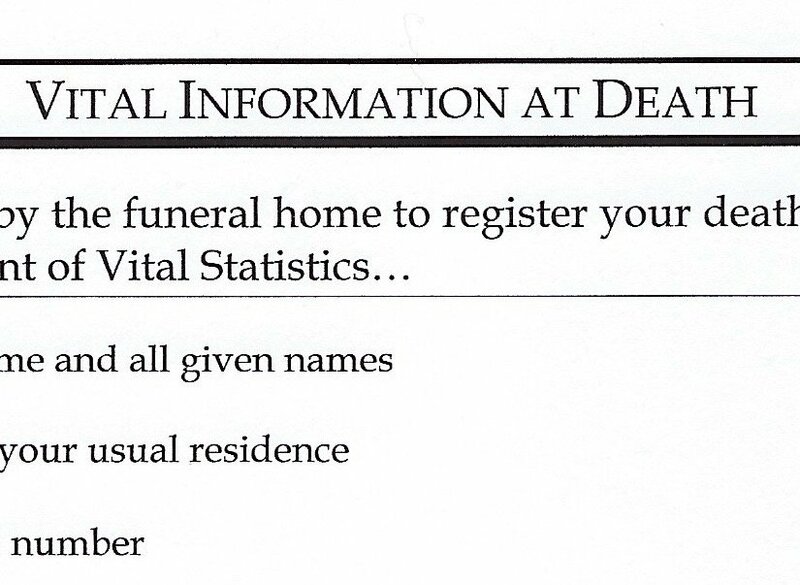 Apparently, funeral homes are required to submit information about your lineage when registering your death with the provincial government. I have no idea why the federal government needs to know about Family Allowance cheques I received half a century ago…and I didn’t ask. But you can be sure I wrote down the answers to those tricky questions and gave them to my kids. Here’s a blank copy with space to fill in your answers to questions that might be tricky for others. Click on the thumbnail below for a PDF version or here to download the Word File. We all know there are documents we should have in place before we die—not just one, but about half a dozen. Where to start?!! 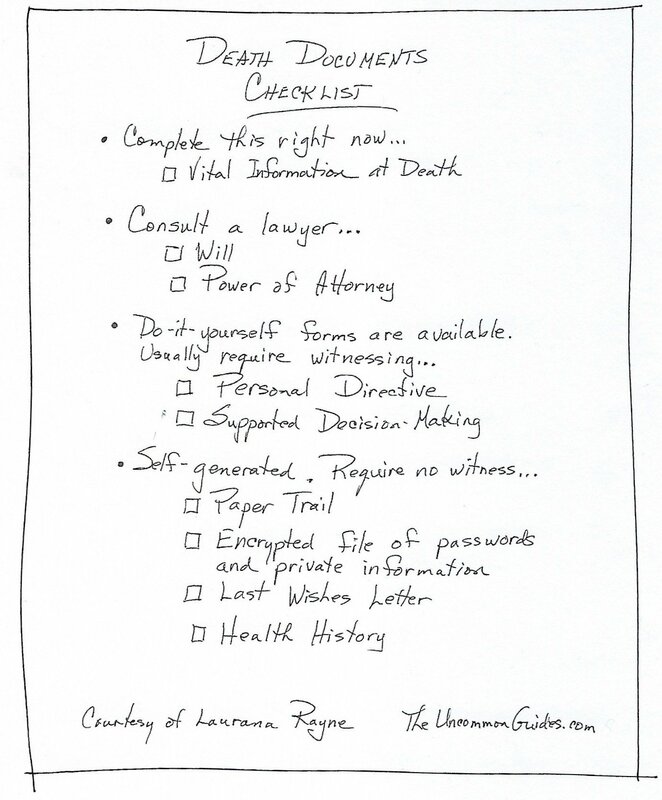 Print it and put a checkmark beside the documents you’ve already completed. Look at the unchecked items and focus on the one closest to the top. Beside that item, write down the first thing you’ll do to get it underway. Give your yourself a completion date for that first step. Then do it. If you feel stuck, review my blogs on the various documents. You may find that you have more than one document on the go at the same time because you’re waiting for something—your appointment with the lawyer, a chance to get to your safety deposit box and check on an item in there, an opportunity to discuss your personal directive with your children before arranging to have your signature witnessed, etc. The key is to keep things moving and tick off items as they are completed. When you check off the last one, do a happy dance! Snoopy Happy Dance from David Innes on Vimeo. *** Time for this post? Reading… 13 minutes. Longer than usual but it will save you time in the long run. Although a hand-written will is legal in a few places, and you can always buy will forms and fill in the blanks, there’s plenty of room for error when you do it yourself—especially if your situation is in any way complicated. That’s why it’s recommended that you see a lawyer for both your Will and Power of Attorney. The prospect of visiting a lawyer can be intimidating—sometimes because of fear of the cost (see here for clarification and reassurance), and usually because of a lack of familiarity with the terms and procedures. This post is meant to help you feel more comfortable about consulting a lawyer to draw up your documents. You—the person making the Will—are known as the testator. Your estate consists of the assets you have acquired. A beneficiary is someone who inherits something from your estate. A bequest is what you leave to your beneficiaries via the terms of your will. In your will, you designate an executor (executrix is sometimes still used as the feminine form of the word) to look after administering the Will following your death. You can think of this person as a business manager who ensures your affairs are properly wrapped up and the estate is dispersed to the beneficiaries. Once the executor has completed the necessary steps, an application for grant of probate will be submitted to the government. Probate means proving the will. 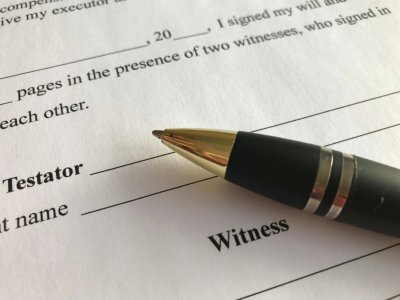 It is a legal procedure for verifying that the person named in the will has died, that the will is valid, and that the executor is confirmed. This is required before property may be sold or transferred, and before a financial institution may release funds that belonged to the deceased. If you are supporting minor children, guardians should be named to act as substitute parents until the children are of legal age and can live independently. If you are responsible for a dependant adult, a guardian should be named for that person. If you’ve done your thinking in advance, the appointment with your lawyer can be efficient and relatively painless. I’ve outlined the four main areas below. Give them due thought, but don’t get stuck. You’re paying the lawyer for advice, so outline your dilemma and let the lawyer offer his or her perspective. A professional point of view might be all you need to see things clearly and come to a decision about what works best for you. #1—Decide on an executor to look after settling your estate. You’ll want to choose someone who is reliable and trustworthy as well as capable. Since the executor will be looking after your business affairs, it helps to select someone who is comfortable with paperwork and dealing with professionals. Your executor may hire an accountant and a lawyer to do most of the work but would need to be able to liaise effectively with them. 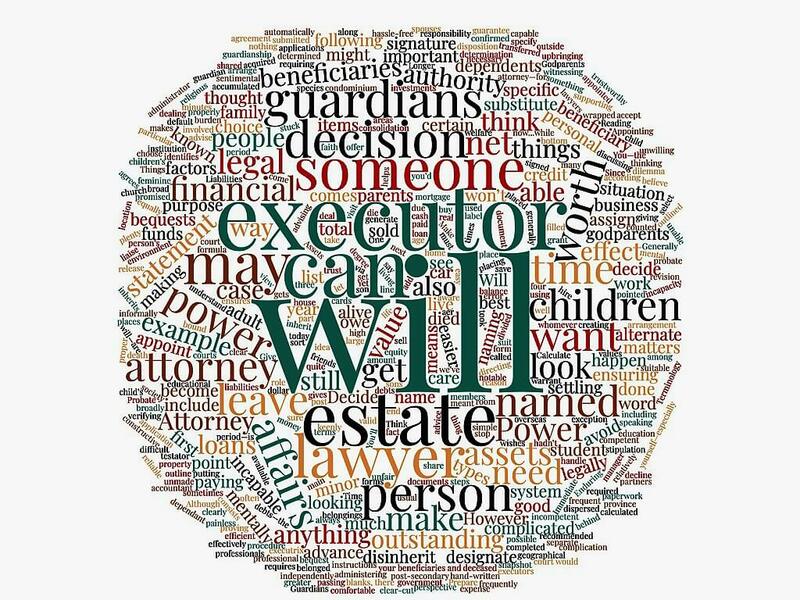 When you decide on an executor, make sure that person agrees before naming him or her in the will. This is important because someone named as an executor may decline if unable or unwilling to accept the role. If that were to happen, the court would appoint an administrator. The work would be done, but at greater expense to the estate, so avoid this complication. A beneficiary may be an executor. In fact, spouses and partners frequently appoint each other, with an alternate in case they both die at the same time. The executor may live outside the province, but this makes things more complicated in settling the estate. #2—If you have minor children, decide on guardians and get their agreement. Guardians are substitute parents, and there are many factors to think about, from shared values to geographical location. Appointing guardians is generally the most difficult decision because often there is no easy and clear-cut choice. The most constructive thing you can do is sort through all the factors to make the best decision you can. If you leave this decision unmade, the courts will do it. You have no guarantee their decision would be what you’d want, and at that point you won’t be able to do anything about it. Do not default on the decision of guardianship because you believe that your children’s godparents will automatically become their guardians. This is not the case. Godparents are appointed under the authority of the church for the purpose of ensuring the child gets a proper religious upbringing in that particular faith. The court is a separate system and requires you to specify your choice for guardians in your will. However, there is nothing to stop you from naming the people who are the godparents to also be your child’s legal guardians, if that would best suit your situation. #3—Prepare a net worth statement. 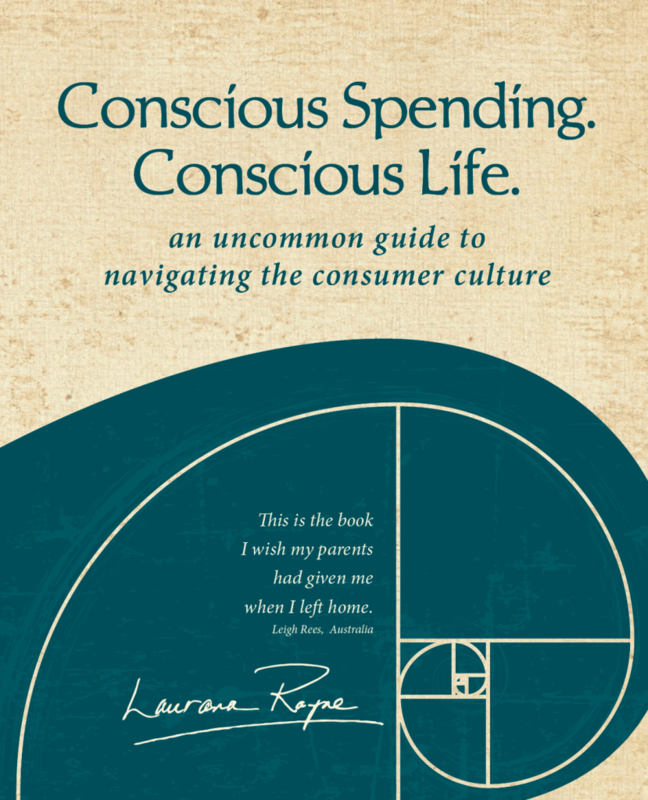 A net worth statement is a snapshot of your financial worth at one point in time. With this information, both you and your lawyer will be clear about what you’ll be passing along to those you leave behind. Assets are what you own. They can include personal belongings, car, house, cash, and investments of all types. Make a list of your assets, assign each a dollar value according to how much you could sell it for today, and add them together to find the total value of your assets. Liabilities are what you owe. They include all your debts—the outstanding balance on your credit cards and outstanding loans of all types (student, personal, car, home equity, mortgage, line of credit, consolidation, and loans from family members or friends). Calculate the total amount that you owe. It is important to understand that debts must be paid from the estate before the beneficiaries get anything. You might say in your Will that you leave $100,000 to someone, but if that money has to go to paying off an outstanding loan, they won’t get anything. #4—Decide on your beneficiaries and what they will inherit. By and large, you can leave whatever you own to whomever you want. However, you cannot legally disinherit dependents. This is for good reason—they are your responsibility. If you could disinherit dependents, the welfare system would have to care for them, which is an unfair burden on society. If there are sentimental items you have promised to specific people, you can handle this informally by putting a name label on the bottom and taking photos or creating a list of such items and advising those involved, including the executor. The value of such bequests would be counted as part of the person’s share of the estate. A Will gives your family instructions about your wishes for disposition of what you have accumulated and only comes into effect after you’ve died. Yet it is quite possible you’ll need someone to look after certain things while you are still alive. Here is a very real example. If I were alive but incapable of living on my own and directing my affairs, my condominium would have to be sold to generate funds for placing me in a more suitable environment. The hassle-free way of ensuring this is for me to assign authority to my adult children while I am still competent. This authority is known as a Power of Attorney. Before visiting your lawyer, decide who you want to appoint to look after your financial affairs when you can’t. It’s also a good idea to name an alternate in case the first person is not able or available. An Enduring Power of Attorney is set up in advance to take effect if you become mentally incapable. My Power of Attorney specifies that it only comes into effect when it has been determined that I am mentally incompetent, and it identifies how that determination will be made. Mental incapacity is not the only time you may want to give someone power of attorney over your financial affairs. One of my sons, for example, took some of his post-secondary education overseas. The first year we hadn’t thought about how he would deal with matters such as student loans, certain educational applications, and other matters requiring his signature. It was much easier the next year when I had power of attorney. However, I was keenly aware of the high degree of trust that had been placed in me. As the lawyer pointed out when we signed the document, my son was legally bound by my signature, as if it were his own, for the period of time the arrangement was in place. This power of attorney—for a specific purpose or time period—is called an Immediate Power of Attorney. Your Will and Power of Attorney are meant to make life easier for the people you care about. Think about it now...while you can. Next week we’ll take a step back and look at the big picture.